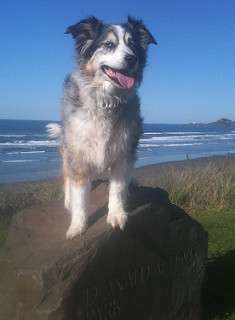 In addition to their veterinary significance, the findings by Oregon State University researchers advance the understanding of a type of malignant tumor, osteosarcoma, that's often diagnosed in humans as well, typically afflicting teenagers and young adults. "This is one of the first steps into identifying cholesterol as a potential biomarker for canine osteosarcoma," said Haley Leeper, a veterinary oncology resident at the OSU College of Veterinary Medicine. "We don't have answers as to why high cholesterol is associated with this disease and with a better prognosis, but we're hoping to advance these findings in future research." Researchers found nearly half of the dogs with cancer—29 of the 64—had elevated levels of total serum cholesterol, a dramatically higher rate than occurred in either control population; just three of the 30 dogs with broken bones, and only two of the 31 healthy animals, showed high cholesterol. "When people think of cholesterol they think of cheeseburgers and heart attacks," Leeper said. "However, cholesterol is involved with many key processes and structures in the body like cell membranes, bone health and the immune system." Future studies that follow dogs long term and look at specific lipid content in the blood may shed light on the mechanisms behind cholesterol's role in enhanced survival, Leeper said. Collaborators included Craig Ruaux and Shay Bracha, colleagues of Leeper in the Department of Veterinary Clinical Sciences, and Austin Viall of the Department of Veterinary Pathology at the Iowa State University College of Veterinary Medicine. Findings produced by this retrospective study were published in the Journal of Small Animal Practice.